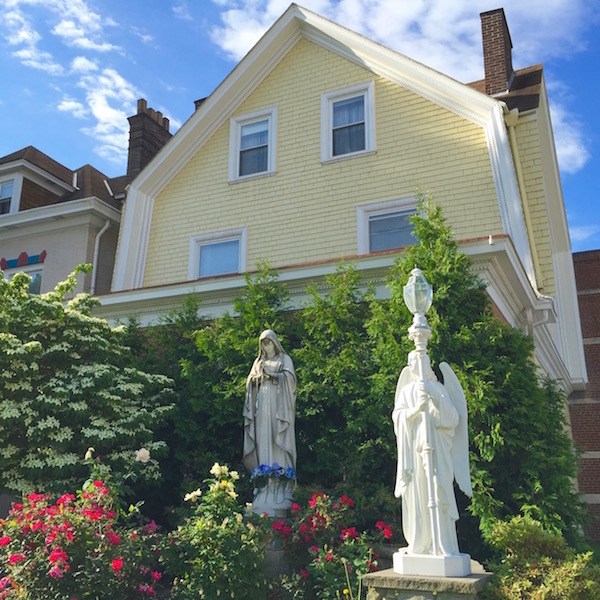 Mary–yes, that Mary–may have come from Nazareth, but she’s definitely got a second home in Bloomfield. 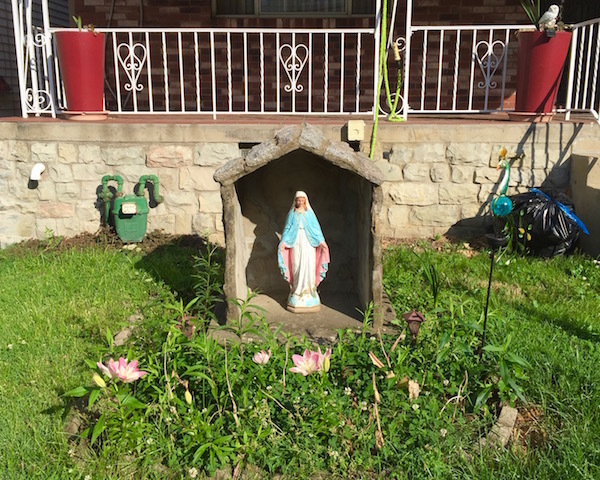 Maybe even third and fourth homes–for a blessed virgin, she gets around! 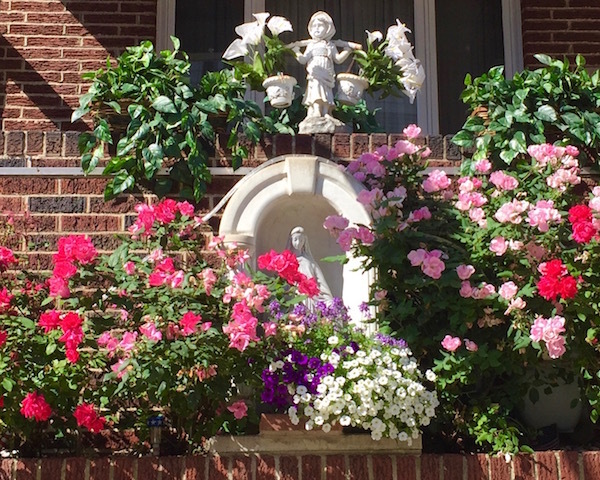 Decked out and ready to party in a Hawaiian lei, flanked by flowers, angels, cherubs, lights, and crosses, Mary is the centerpiece of postage stamp front yards, stoops, and porches. 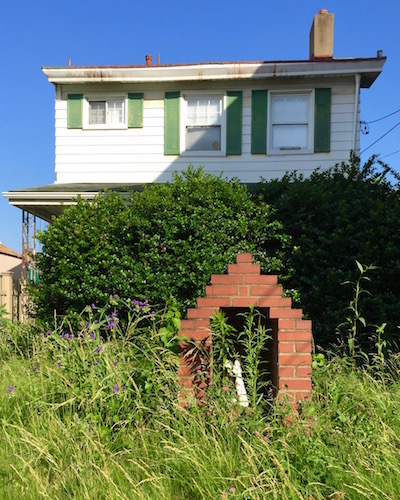 Bloomfield is not known for its private green spaces–I’m sure suburbanites would guffaw at what passes for a “yard” in the neighborhood. 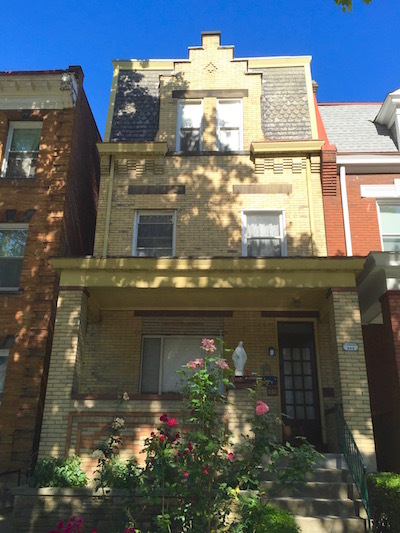 The tight row houses are usually built right up to the sidewalk, some with porches, but almost never any grass. So it’s doubly impressive that with so few houses even able to host a grotto, many have chosen to do so. 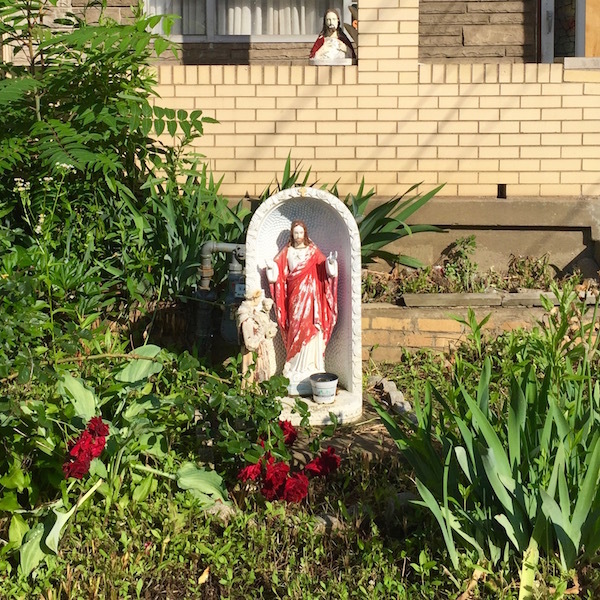 The mother of all Front Yard Marys: Sisters of the Holy Spirit convent, Friendship Ave.
An interesting corollary to the front yard Mary is the sub-phenomenon of ex-front yard Marys, or empty Mary grottos. What’s happened to Mary? Where did she go? 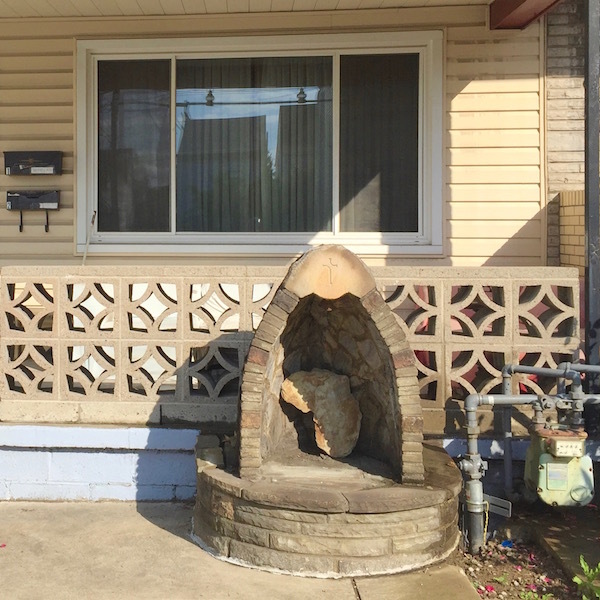 Hopefully one day we’ll run into the homeowners and get the full story. Until then, we can only guess that the original owners of the statues have moved on and taken Mary with them. Alternately, Mary may have been stolen, kidnapped, or ransomed. 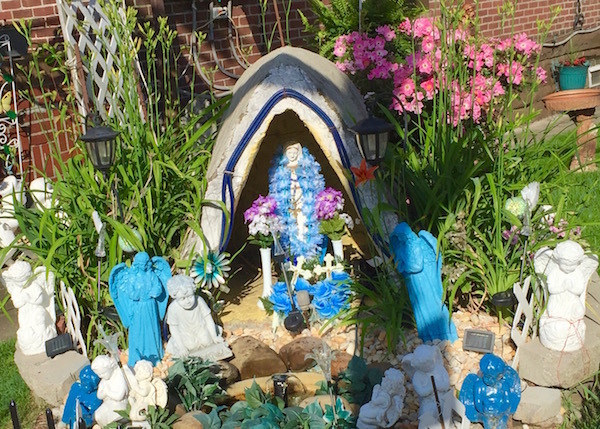 These homemade brick and concrete grottos clearly aren’t going anywhere, so it’s no wonder they’ve become permanent fixtures on the property, with or without Mary. 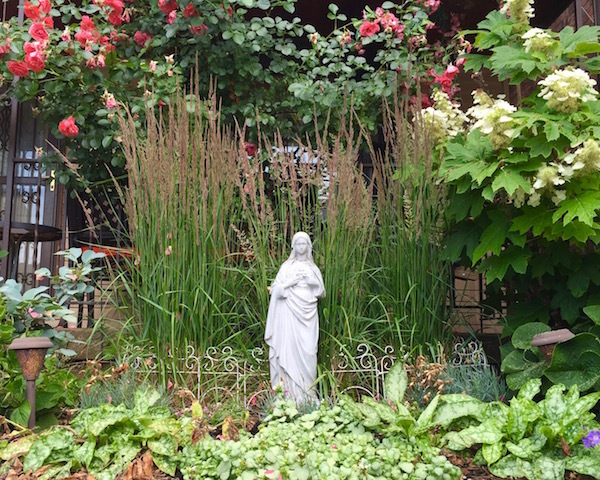 We’re collecting other front yard deities for a future scene report, but it bears mentioning that Jesus gets into the front-of-house tributes as well–just not as often.